Speedball Baren. This premier Baren is made of heavy-duty plastic padded with foam, polyethylene, and comfortable grip wooden handle. Ideal for hand printing and proofing of block prints. Puts pressure on page evenly for a better ink image. - MADE IN THE USA - The Speedball Block Printing Baren is proudly made in the USA! - SMOOTH SLIDE DESIGN - The face of the baren is covered in nitex nylon which creates an ultra smooth glide across your paper. 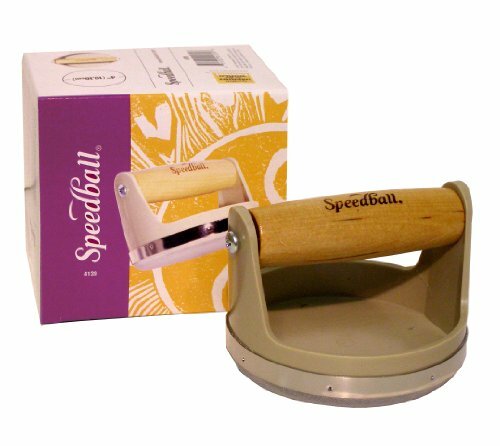 - BLOCK PRINTING TOOL - The Speedball Baren is designed to help you create gorgeous prints. This block printing tool measures 4 inches in diameter. - CREATES BETTER IMAGE - Using a printmaking baren is much more efficient than using your hands. It evenly distributes pressure creating a better ink image. - COMFORT GRIP HANDLE -The baren for block printing has a smooth, wooden handle. The handle is super comfortable and the perfect size for everyone.